Accurate, repeatable, easy to use with a fully aligned software, hardware and materials lineup. Ultimaker makes it easy to produce accurate, robust parts. Introducing the newest addition to the Ultimaker family. The state of the art, large volume FFF dual extrusion 3D printer allows for the most hands off Ultimaker experience yet. With a flow sensor to detect filament outages, 20+ point automated bed leveling, mesh compensation and glass front enclosure, repeatable results with even the most demanding materials are a breeze to use right on your desktop. Ultimaker | Why Choose Ultimaker? There are hundreds of 3D printers out there, the landscape is rife with misleading statistics and buzzwords. Why choose an Ultimaker? There's a reason Ultimaker is the global leader in the professional desktop 3D printing market partnering with some of the largest manufacturing companies like Volkswagon and Bosch, and strategic materials alliances with BASF, Dupont and Mitsubishi. The simple answer is the core functionality such as reliability and quality. While many companies will tout features and gimmicky tricks to capture the headlines, Ultimaker printers are laser focused on the basics of what makes a printer reliable. Proven to work on the field 15-24 hours a day for a year without much maintenance and churning out production part after part. Reliability and repeatability is the key when that deadline is looming. The quality of prints produced by the Ultimaker speak for themselves. 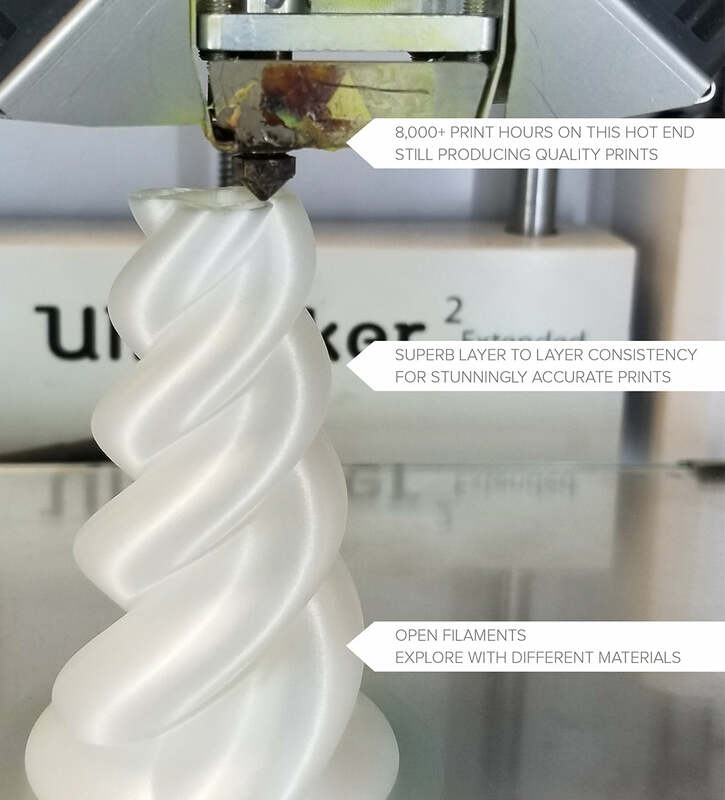 With a default standard resolution that is often reserved for "high" quality on other printers, Ultimakers are known for producing fantastic results with strong layer bonding without the need to mess with calibration. Allowing you to focus on the design and engineering of your part, instead of your printer. With the alignment of Ultimaker software (Cura), hardware and materials. It's easy to print a plethora of materials available to FFF printing. Presets for all Ultimaker materials are already preloaded on the printer and software so using difficult engineering materials is as easy as ever. Not satisfied? Ultimaker has an open platform allowing you to use 3rd party materials as well recycled plastics or other specialized materials like carbon fiber filament. 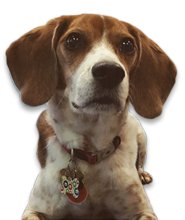 Our team is available to answer any questions on compatibility or usability concerns you have. 3D Printing enables you to make almost anything you can imagine. As unique as that concept is, it brings out particular challenges. Sometimes the standard settings may not be optimized for your unique part, or something may go wrong. That's where Ultimaker has a leg up on everyone else. Shop3D.ca is the primary support partner for Ultimaker in Canada, so we will be able to help you through virtually any problem you encounter. Be it slicing, hardware, software, we have experts ready to assist. From training, to site scans and rollouts, or even basic slicing optimization, we do it all. And best of all we provide it all within Canada serving Canadians with same day support. Never worry again about cross-border duties or taxes or funny time zones at call centers. Shop3D.ca is proud to offer the highest level of technical and warranty support, service and consultation for Ultimaker 3D printers across Canada. We're not your typical tech support. We use these printers every day on production projects so we experience the same challenges you do, know the best way to solve it and can get you up and running in the right direction as quickly as possible. Have peace of mind working with a manufacturer that enables it’s reseller to take direct responsibility to providing you the best local support north of the border. Ultimaker | Which one is right for you? Unsure of which model to choose? Let us help you narrow it down! If you're looking for a next generation hands off, easy to use, dual extrusion printer where it can handle just about any model you throw at it. The Ultimaker 3 is the best choice. Middle of the road, with a robust feature set with an ingenious dual extrusion setup ensures easy, smooth operation on even the most complex parts. Is the S5 right for you? The flagship Ultimaker S model. If you need all the bells and whistles, the S5 has it! Featuring a large build area, dual extrusion and hardened feeder. The S5 comes complete with features and software alignment for aximum versatility and unattended use. Setup for future improvements so it can stay on the leading edge of technical revolution. The reliable workhorse. Starting at a lower price point than the Ultimaker 3 or S series printer. It is not rare to see an Ultimaker 2+ with over 10,000+ hours of print time clocked, still churning out production parts day after day. Built solid for reliability and easy maintenance. It is the ideal printer for a school or production environment where you just need parts printed in excellent quality with repeatability day after day. Materials | What is best for my application? 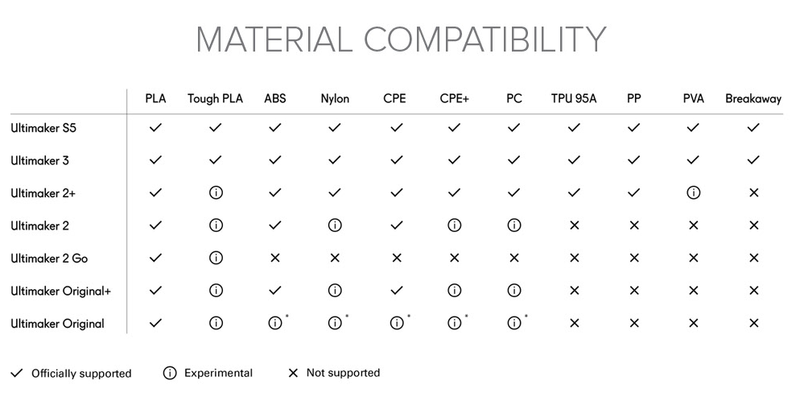 Ultimaker has a wide range of materials. Whether you're testing a prototype for fit and dimensional accuracy, or a final use part that will go into an assembly. There's a material that will fit your needs with profiles already setup and built into the software and hardware. PLA is the easiest to use material with low warping and fantastic surface finish. This no fuss material will stick well onto glass and naturally lift off when cold. Produces some of the best material finishes for high detail parts. Mechanically it is very rigid with good layer bonding qualities. We at shop3d.ca recommend PLA for almost all applications. Only when PLA fails at the application do we suggest an alternative. CPE (copolyester) materials are chemical resistant, tough and demonstrate good dimensional stability. It is a preferred choice for both functional prototypes and mechanical parts. While both CPE and CPE+ prodvides similar performance characteristics, CPE+ provides the added beneffit of higher temperature resistance and increased impact strength. Used by an array of industries worldwide, ABS (acrylonitrile butadiene styrene) is known for its good mechanical properties. Specifically formulated to minimize warping and ensure consistent interlater adhesion, our ABS allows the creation of functional prototypes and complex end-use parts with ease. Highly versatile for industrial applications. TPU 95A (thermoplastic polyurethane) filament is the go-to choice for a wide array of manufacturing projects that demand the qualities of both rubber and plastic. Designed for 3D printing consistency TPU 95A is a semi-flexible and chemical resistant filament with strong layer bonding. In addition, it is easier and faster to print than other TPU filaments. With Ultimaker PC (polycarbonate) filament, you can print strong and tough parts that retain dimensional stability when subjected to temperatures as high as 110 ºC. Our PC is a perfect filament for printing molds, tools, functional prototypes and parts for short-run manufacturing. Used by many manufacturers worldwide, Nylon (polyamide) is well known for its impressive durability, high strength-to-weight ratio, flexibility, low friction and corrosion resistance. With its ability to withstand significant mechanical stress, Nylon is a great choice for 3D printing tools, functional prototypes and end-use parts. Ultimaker Tough PLA is a technical PLA (polylactic acid) material with toughness similar to ABS. 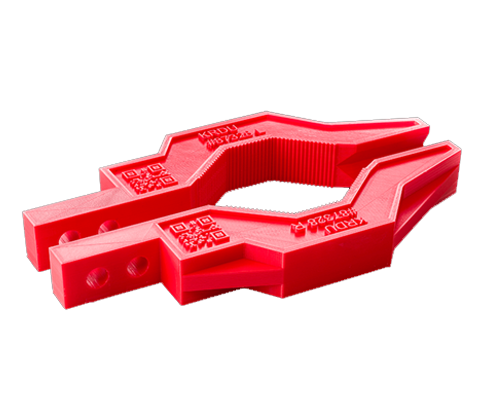 Ideal for reliably printing functional prototypes and tooling at larger sizes, our Tough PLA offers the same safe and easy use as regular PLA. The finish is more matte compared to standard PLA.